This midcentury modern house designed in line with iconic style of Frank Lloyd Wright is blazing with character, inside and out. 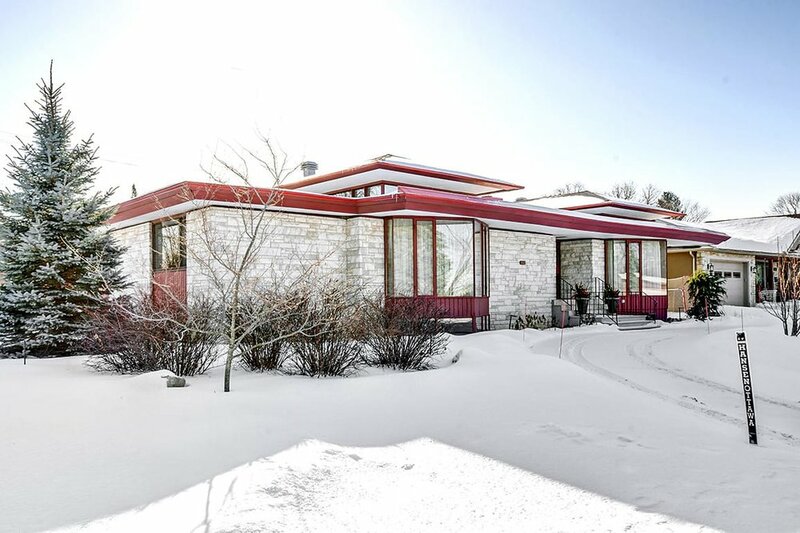 Situated in a posh suburb of Ottawa, The Weiner Residence was designed by the prolific architect James Strutt in 1958 for Eleanor and Paul Weiner. 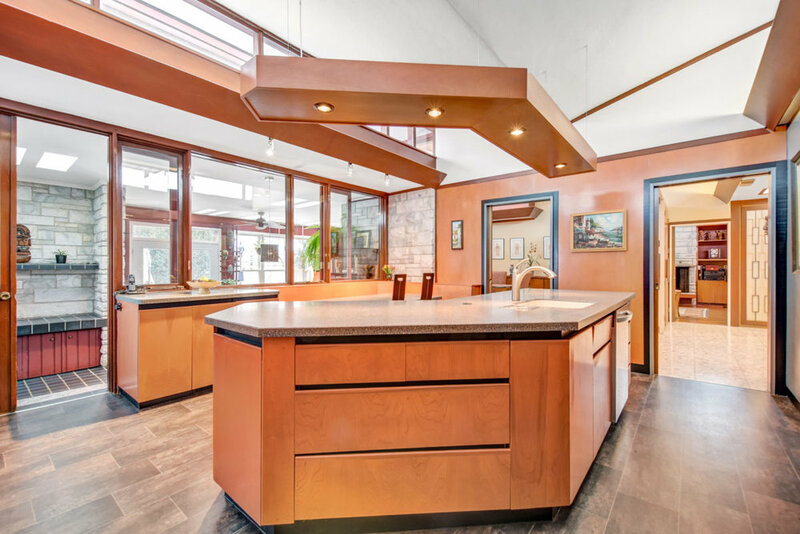 Spanning over 3,800 square feet on the main level and an additional 2,000 square feet in the basement, the elegant home is an eyecatcher, to say the least. There’s nothing modest about this house; from the outside, white Georgian marble establishes the sides of the home, accented with California redwood trim. Looking from the street, the Strutt house has the appearance of a refined ornament. Calculated details such as clerestory windows, raised roofs and a cluster of skylights, which allow sunbeams to pour in throughout the day. Inside, a mix of terrazzo and wooden flooring lay down the color scheme for the interior. Sunken living rooms paired with custom designed screens to separate the spaces fall nothing short of flamboyant and throughout the house, the redwood trimming is consistent. It comes as no surprise that this modern midcentury home used to become alive with cocktail parties; the home was as if made for it in all its extravagance, from the large central foyer to the stunning living and dining room spaces. Rumor has it that legendary party host himself, Frank Sinatra, has been among guests of the residences glamorous cocktail parties. The grandeur begins from the moment of entering the home. The same white marble from the home’s exterior adorns the corridors walls, met with large redwood doors decorated with white detail. On either side, narrow windows extend from floor to ceiling, one window interrupted by a beautiful wooden mailbox in the middle. An additional skylight ensures plenty of light to beam in. The interior layout allows for the various spaces to be either open or closed off from one another and many of the areas are accessible from more than one side. When all spaces are opened, the entire home has an open plan feel while the option for privacy is conveniently there. 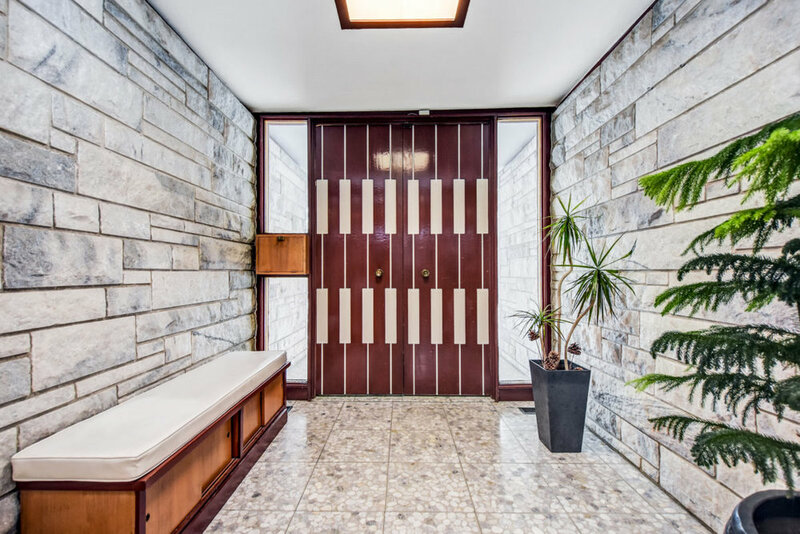 From the meticulously selected materials to the tastefully synchronized interior decor, this midcentury home is an exceptional treasure in Ottawa’s suburban landscape.